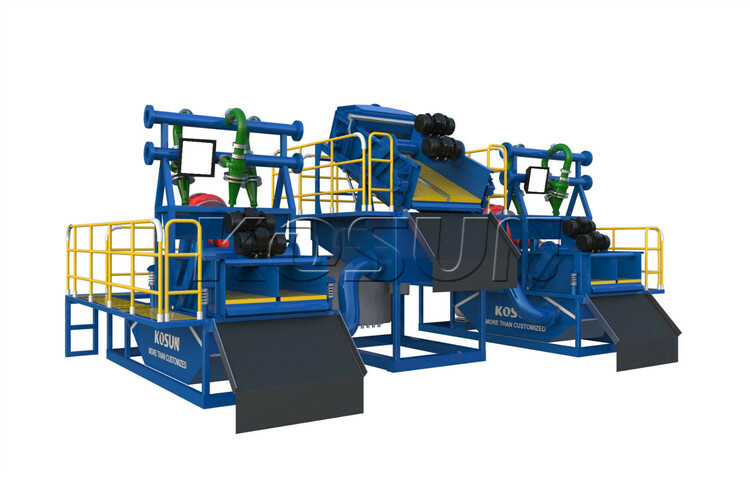 Rotary drilling rigs mud system can also be used in different industries for different purposes.The main separation equipment on a mud separation unit are the shale shaker, mud cleaner, the desander, the desilter as well as the decanter centrifuges. They are however available across different sizes and applications but they do maintain the same principle of liquids and mud separation. Two options of shale shakers are used on a mud separation system. There are primary shakers and secondary shakers, primary shakers make use of coarse screens so as to take our larger cuttings while the secondary shakers consists of fine mesh screens and this enables it to get rid of the finest particles. There is additional separation that is done on a mud separation unit, this is done so that the finest particles can be totally removed from the system. . The mechanical equipment that is used at this stage is inclusive of hydrocyclone desanders and desilters, mud cleaners and rotary bowl decanting centrifuges . A liquid mud plant has different types of tanks that are useful for storage and mixing the drilling mud, the dredge slurry dewatering system is used for dredging slurry treatment to remove solids and discharge can water on a mud separation unit. Solid removal units are usually functional for diamond core drilling in the mining industries and they are used to recycle drilling fluids and water. There are also mud separation systems that are used of oil and gas. 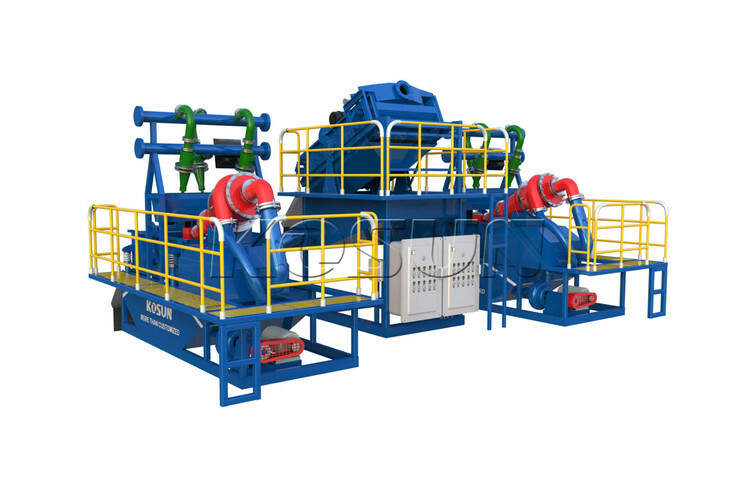 The oil and gas drilling solids control system makes it possible for the reuse of drilling fluids that would have come from oil and gas drilling. Rotary Drilling Rigs Mud System generally use hydraulic crawler telescopic chassis, self-landing folding folding mast, telescopic drill pipe, with vertical adjustment automatically adjust the depth of digital display, the whole machine is generally used hydraulic pilot control, load sensing, With the operation of light, comfortable and so on. Rotary drilling construction to be equipped with a special rotary drilling mud slurry treatment system. The main and vice two winchs can be applied to the needs of the site. This type of drilling rig with different drilling tools for dry (short spiral) or wet (rotary bucket) and rock (core drill) into the hole operation, but also with a long helix drill, underground wall grab, vibration pile hammer Etc., to achieve a variety of functions, mainly for municipal construction, highway bridges, industrial and civil construction, underground wall, water conservancy, anti-seepage slope and other basic construction. Domestic experts believe that: rotary drilling rig in the next few years there is still a large market. The rotary drilling rigs mud management system is an important part of the rotary drilling construction. Rotary drilling rig construction as a new construction technology, is a suitable for the construction of the foundation of the hole in the construction of construction machinery. The role of rotary drilling mud treatment system in the whole rotary drilling construction is very important. In the construction industry more and more widely used in the construction of more and more problems encountered in the future to ensure the quality of piles, lay the foundation for the late construction. Rotary Drilling Rig is a suitable construction machinery for the construction of the hole in the construction machinery. Mainly suitable for sand, clay, silty soil and other soil construction, rotary drilling mud slurry treatment system in the pile, continuous wall, foundation reinforcement and other foundation construction in a wide range of applications, rotary drilling rig rated power in general For the 125 ~ 450kW, power output torque of 120 ~ 400kN · m, the maximum diameter of up to 1.5 ~ 4m, the maximum hole depth of 60 ~ 90m, to meet the requirements of various types of large-scale construction. Rotary drilling rigs mud system transmit rotation to the drillingstring and consequently rotate the bit. During drilling operation, this rotation is to the right. Rotary drilling rigs mud management system main tasks are to create rotation of the drillstring and facilities to advance and lift the drillstring as well as casings and special equiptment into and out of the hole drilled. Rotary drilling into the hole process and other pile foundation, rotary drilling rig drilling technology Rotary drilling rig with static mud wall drilling bucket soil technology (of course, there are dry soil directly to the soil process, depending on the site site conditions may be) , Is a non-rinse medium circulation drilling method, but when drilling to protect the hole wall stability, the hole to fill the high-quality mud (stabilizer). Rotary drilling rig work in place for the overall rotation movement. When the drilling rig is drilled, the drill pipe and the drill bit are cut into the soil by the weight of the drill pipe and the drill bit. The oblique bucket teeth are cut into the bucket during the rotation of the bucket to complete the drilling of the soil. In the case of hard soil, So that the bucket teeth cut into the soil, this time through the pressure cylinder on the drill pipe pressure, forcibly cut the bucket teeth into the soil, to complete the drilling soil. After the bucket is filled with soil, the crane bucket and the bucket are lifted to the ground, and the switch on the bucket is opened. The bottom of the bucket is automatically discharged by gravity. Drill pipe down the door off the door, and then turn to the hole for the next bucket of mining. Rotary drilling rigs are mobile, flexible, and can be quickly displaced or moved to the next post. Steel cage processing, hanging, post-grouting technology with other pile construction. Kosun has rich experience and best after sale service that is well recognized and welcomed by clients all over the world. We are looking forward to cooeration with you. Rotary drilling rigs slurry separation system -Kosun rotary drilling drill is a suitable construction process for forming holes in building foundation engineering. Widely used in municipal construction, highway bridges, high-rise buildings and other infrastructure construction, with different drilling tools, adapted to dry (short spiral), or wet (rotary bucket) and rock (core drill) hole operations. Rotary drilling rigs slurry separation system helps rotary drilling rigs achieve stabilized boreholes: Rotary Drilling Rigs can be used to create an excellent viscosity environment at lower concentrations. Rotary drilling rigs with chemical mud of the long molecular chain package Disordered dispersion of mud, through the formation of different layers of connecting bridge to ensure the stability of the surrounding strata, to stabilize the role of the wall. Rotary drilling rigs mud system can help rotary drilling mud to achieve suspended cuttings: when the cycle, the rotary drilling rig for chemical mud in a stopped state, which rotary drilling rigs for chemical mud polymer can be linked to each other to form a structure, The cuttings will be suspended. Rotary drilling rigs mud system can help to drive the drilling mud to obtain the formation information: a lot of information can be obtained from the cuttings of the chemical mud. Such as stratigraphic physical properties, oil, gas display and so on. Rotary Drilling slurry system can help to drive the drilling mud to achieve the transmission power: rotary drilling rig for chemical mud can be mud pump power from the drill string from the drill pipe high-speed jet to the bottom of the drill hole to improve the ability to break the rock Drilling speed. 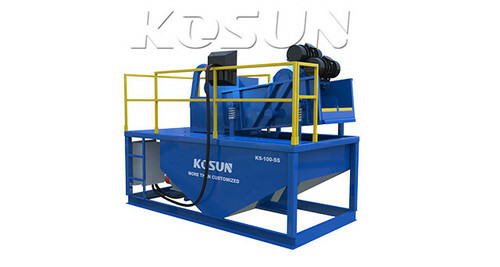 Kosun rotary drilling mud system has been applied in many large projects and the effect is remarkable, by many professional rotary excavation construction unit of praise. Rotary Drilling Rigs Slurry System can help to drive the drilling mud to obtain formation information: a lot of information can be obtained by cutting the cuttings of the chemical mud. Rotary drilling rigs generally use hydraulic crawler telescopic chassis, self-landing folding folding mast, telescopic drill pipe, with vertical adjustment of vertical adjustment, hole depth digital display, the whole machine is generally used hydraulic pilot control, load sensing, With the operation of light, comfortable and so on. Rotary drilling drilling construction to be equipped with a special rotary drilling mud waste management system. 1. Rotary Drilling Rigs Slurry System can help to drive the drilling mud to achieve balanced formation pressure: Rotary Drilling Rig for chemical mud slurry pressure must be balanced with the formation pressure in order to prevent blowout or rotary drilling rigs for a large number of chemical mud into the formation of the purpose The Can adjust the density of the mud by controlling the mud column pressure, so that it is balanced with the formation pressure, play the role of anti-leakage plugging. 2. Rotary Drilling Rigs Slurry System can help rotary drilling mud to achieve cooling lubrication drill bit: rotary drilling rig for chemical mud can be drilling process drilling (drill bit and drill string) and stratum friction generated by the heat to the ground, from the cooling effect. At the same time, rotary drilling rig for chemical mud can effectively reduce the friction between the drill and the formation, from the lubrication effect. 3.Rotary Drilling Rigs Slurry System can help to drive the drilling mud to achieve a stable borehole wall: Rotary drilling rigs can be used to create an excellent viscosity environment at lower concentrations. Rotary drilling rigs with chemical mud of the long molecular chain package Disordered dispersion of mud, through the formation of different layers of connecting bridge to ensure the stability of the surrounding strata, to stabilize the role of the wall. 4. Rotary Drilling Rigs Slurry System can help rotary drilling mud to achieve suspended cuttings: when the cycle, the rotary drilling rig for chemical mud in a stopped state, which rotary drilling rigs for chemical mud polymer can be linked to each other to form a structure, The cuttings will be suspended. 5 Rotary Drilling Rigs Slurry System can help to drive the drilling mud to achieve the transmission power: rotary drilling rig for chemical mud can be mud pump power from the drill string from the drill pipe high-speed jet to the bottom of the drill hole to improve the ability to break the rock Drilling speed. Rotary drilling rigs slurry system can help to drive the drilling mud to obtain formation information: a lot of information can be obtained by cutting the cuttings of the chemical mud. Such as stratigraphic physical properties, oil, gas display and so on. Rotary Drilling is a construction process suitable for forming the hole in the foundation of the building. Widely used in municipal construction, highway bridges, high-rise buildings and other infrastructure construction, with different drilling tools, adapted to dry (short spiral), or wet (rotary bucket) and rock (core drill) hole operation. Drilling and drilling mud system is the necessary equipment for rotary drilling. 1 Rinse bottom hole: Rotary drilling rigs slurry can be formed in the drill pipe water at the high-speed flow, spray to the bottom of the hole. This high-speed jetting rotary drilling rig special chemical mud can be used by the rotary drilling rigs slurry with chemical mud pressure and formation pressure difference is suppressed in the bottom of the cuttings, from the role of washing the bottom of the hole. 2 Rotary Drilling Drain Water System can help to drive the drilling mud to carry the cuttings function: When the rotary drilling rig special chemical mud in the ring on the back speed is greater than the cuttings settling speed, rotary drilling rig special chemical mud can be cuttings Out, that is, at a certain speed on the back, rotary drilling rigs for chemical mud to carry the role of cuttings. 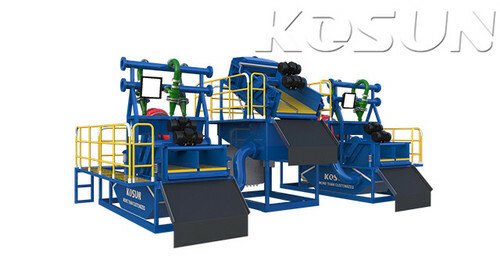 Kosun mechanical rotary drilling mud waste management system has been applied in many large projects and the effect is remarkable, by many professional rotary excavation construction unit of praise. Rotary drilling rigs mud management system is an important part of the rotary drilling construction. Rotary drilling rigs generally use hydraulic crawler telescopic chassis, self-landing folding folding mast, telescopic drill pipe, with vertical adjustment automatically adjust the depth of digital display, the whole machine is generally used hydraulic pilot control, load sensing, With the operation of light, comfortable and so on. Rotary drilling rigs construction to be equipped with a special rotary drilling mud slurry tbm treatment plant system. The main and vice two winchs can be applied to the needs of the site. This type of drilling rig with different drilling tools for dry (short spiral) or wet (rotary bucket) and rock (core drill) into the hole operation, but also with a long helix drill, underground wall grab, vibration pile hammer Etc., to achieve a variety of functions, mainly for municipal construction, highway bridges, industrial and civil construction, underground wall, water conservancy, anti-seepage slope and other basic construction. Domestic experts believe that: rotary drilling rig in the next few years there is still a large market. Rotary drilling rig construction as a new construction technology, is a suitable for the construction of the foundation of the hole in the construction of construction machinery. The role of rotary drilling rigs mud management system is an important part of the rotary drilling construction. in the whole rotary drilling construction is very important. In the construction industry more and more widely used in the construction of more and more problems encountered in the future to ensure the quality of piles, lay the foundation for the late construction.